For an authentic pizza eating experience head up to Pizzicletta in Flagstaff. If you are visiting Sedona and would like to enjoy one of the most scenic drives in the country and then eat some of the best pizza in Arizona, Pizzicletta is the place. Their Neapolitan pizza finds its origins in Italy where the owner traveled around Italy on a bike learning all he could about pizza. 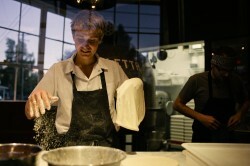 His pizza is simple, flavorful and baked in a custom-made fire kiln in about 90 seconds. The setting is unique and has a down-home atmosphere with community table dining. For dessert the authentic gelato is a must!